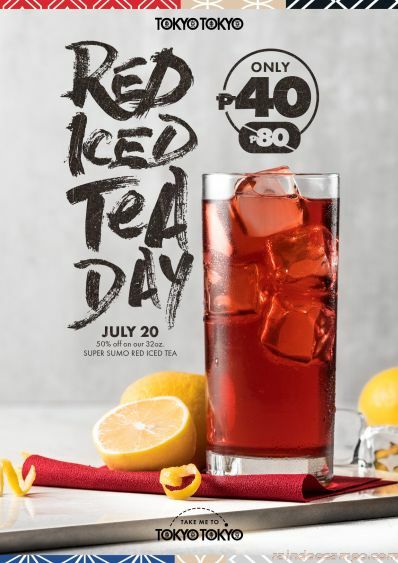 Tokyo Tokyo is once again bringing back a very special one-day-only promo in celebration of its beloved signature drink – RED ICED TEA. Each year, Tokyo Tokyo continues to deliver on its promise of bringing the taste of Japan closer to many Filipinos. What better way to eat these delicious Japanese meals than to pair it with a refreshing beverage? On July 20, don’t miss out as Tokyo Tokyo celebrates its 4th annual Red Iced Tea Day! For one day only, enjoy almost a liter of Tokyo Tokyo’s Signature Red Iced Tea for just 40 Peso, that’s 50% off the original price for a massive 32oz Super Sumo cup of the beverage you love the most! You wouldn’t want to miss out on these sweet savings! Mark your calendars and enjoy your favorite beverage at half the price, available at all Tokyo Tokyo stores nationwide.